For the past year I've been collecting data on the routes that I climb. After each route I mark down the date, the difficulty rating, the route color, the number of times that I fell or asked my belayer to take in slack, and whether I finished the route or not. I now have 337 datapoints, which give a pretty good picture of my climbing activity over the sampled period. 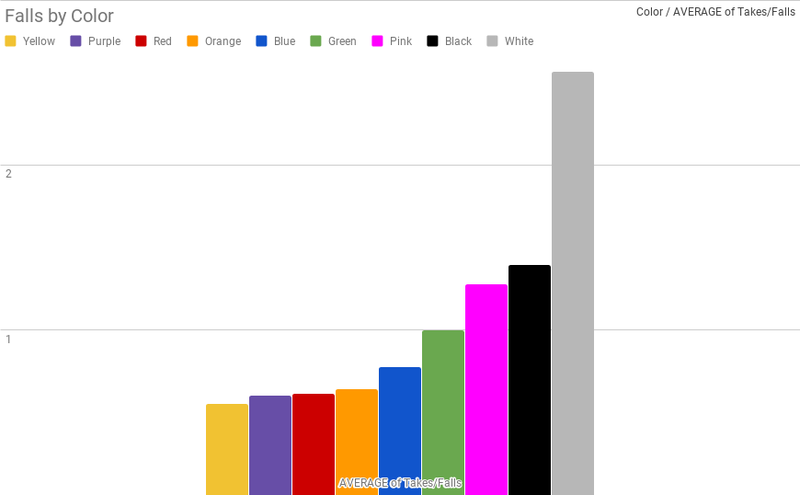 In this post I'll dig into the data to show how different factors influence each other and try to spot some trends. 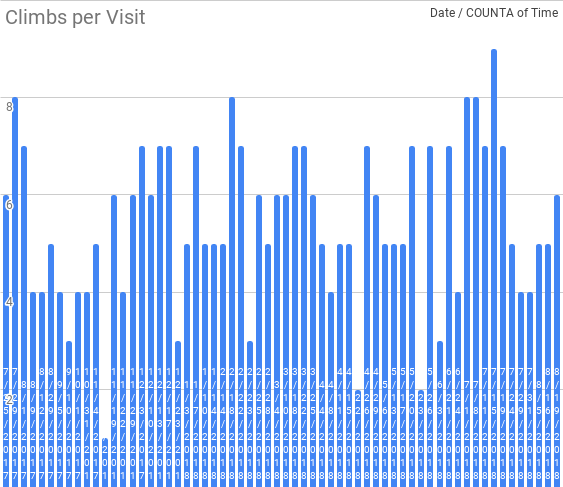 The number of routes I climb per visit is mostly stable around 5-6. 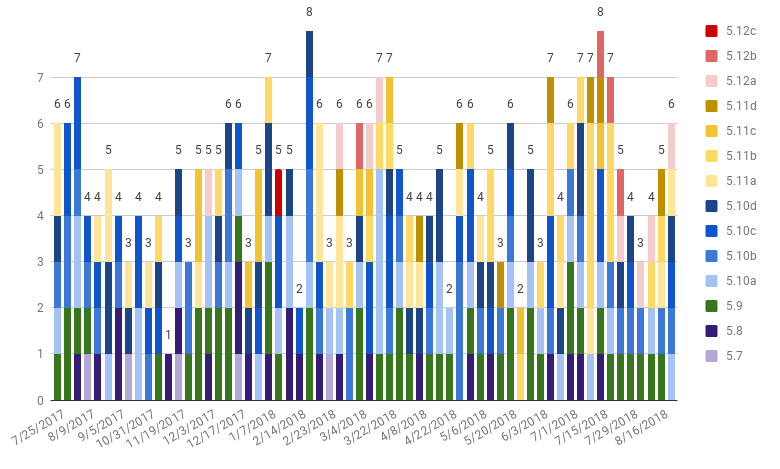 There are a few outliers - some days I climbed 9 (!) routes and a handful with 2 or fewer, but generally a half-dozen routes will be enough for a day. Let's break it down a little more and see if we can get some insights. Here's a chart showing only completed routes, broken down by difficulty. 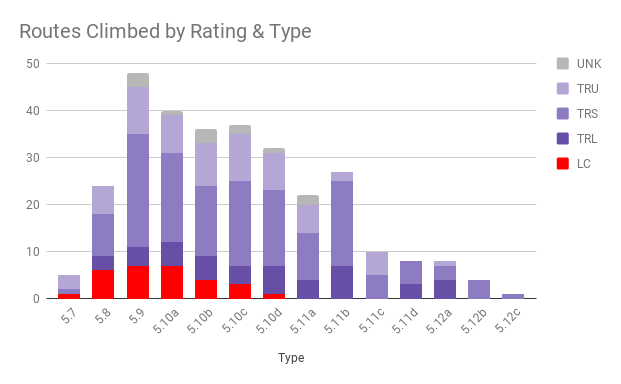 Some interesting things to note here: 5.9's and 5.10's tend to be my mainstay, though 5.11's have started to eat away at some of that recently. I've almost entirely cut 5.7's out of my diet, replacing them with 5.8's as preferred warm-up routes. Late last year I started working on 5.12's, and apparently I finished a 5.12d on January 10th. This is unusual enough that I think it's likely that the route was either over-rated or this is a data entry error on my part. 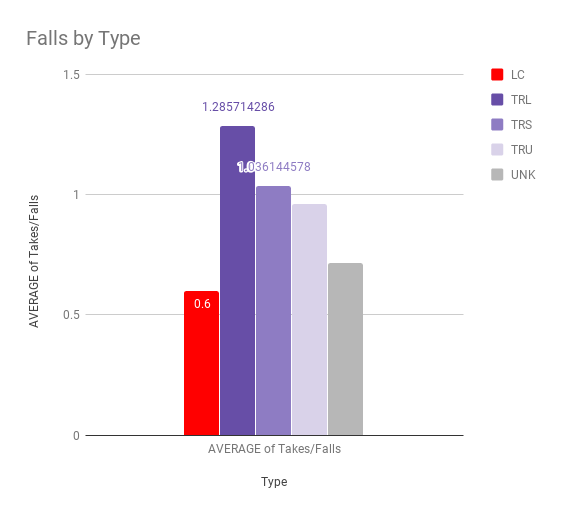 If you're not falling, you're not climbing, so let's take a look at falls. In general it seems that I'm falling more over time, though there's not a very clear trend. Below is a breakdown of falls over time, separated by whether I went on to complete the route or not. 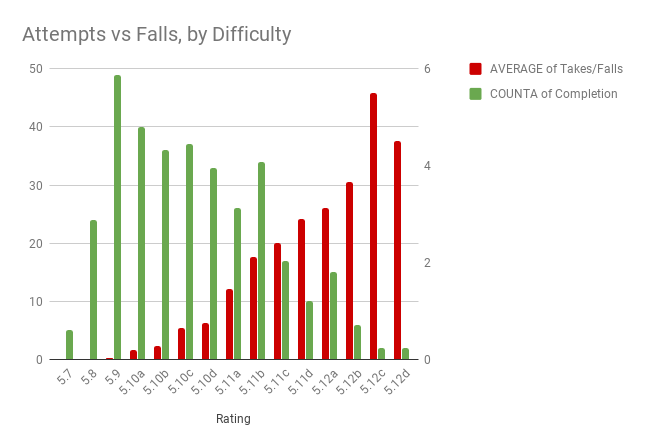 Looking at the breakdown by difficulty instead of date, we can see a clear pattern. Unsurprisingly there's a clear trend here as well: harder routes are, well, harder! The two "unknown" categories are for data captured early on, before I started making a strong distinction between "tall" and "short" routes. At my gym the walls come in two flavors: 35 feet and 50 feet. Shorter routes tend to be easier, requiring less endurance to complete while longer routes require more attention to prevent burnout midway. Lead climbing routes are always set on 50' walls, with only a few exceptions that I rarely climb. As expected, I tend to fall more on longer routes than shorter ones. However, I fall even less on lead climbs, which should be a bit surprising - didn't I say that those are harder? Yes, they are. They're also a lot scarier! I'm very careful when I'm climbing lead routes to avoid falls, and I tend to request breaks from my belayer at the first signs of trouble. It's a bad habit that I need to work to break; there's little risk from a fall once you're above the first few quickdraws, but my lizard brain doesn't think like that. One of my goals for this year is to finally climb a 5.11 route on lead, and I'll have to overcome some of my anxieties about heights and falls to do it. 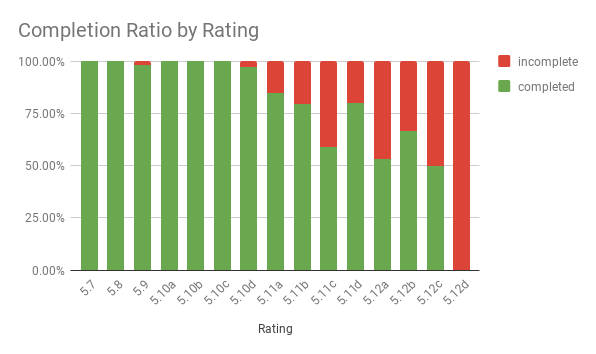 Difficulty and the protection type have obvious relationships to the completion ratios and other metrics, but what about the route's color? 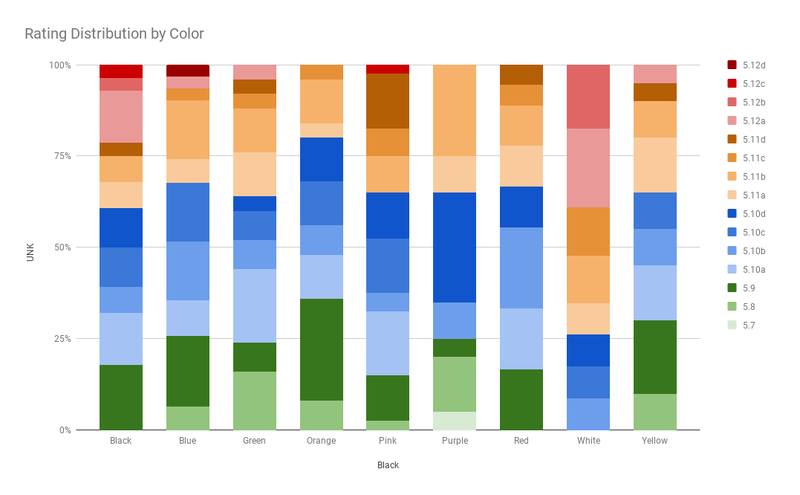 It seems unlikely that color should affect much of anything beyond our aesthetic sensibilities, but the data say otherwise. I fall a lot more on white routes than on any other color. Why? It has to do with the way that my gym sets up their routes. There are two major camps in the indoor climbing community differing in how they treat route colors. One group doesn't care what the hold color is, they'll set what they need based on geometry alone and use colored tape to mark the route to follow. The other group sets monochromatic routes, using only holds of a specific color. Guess which one my gym is? That's right, they're in the monochrome camp. This means that different colors have different types of holds - white, for example, has some of the hardest slopers (large holds with no positive gripping surfaces, requiring you to palm them like basketballs) followed by black - and you can often gauge difficulty somewhat by the route color. Are those kinds of intuitions supported by the data? It would seem so! Keeping in mind that this is just the routes that I've climbed and not all of the routes at my gym, it seems that some colors do indeed tend to be harder than others. White dominates the 5.12 category, while having no examples of 5.9 or below. Conversely, purple and orange routes seem to top out around 5.11. We should take all of that with a generous helping of salt, of course. 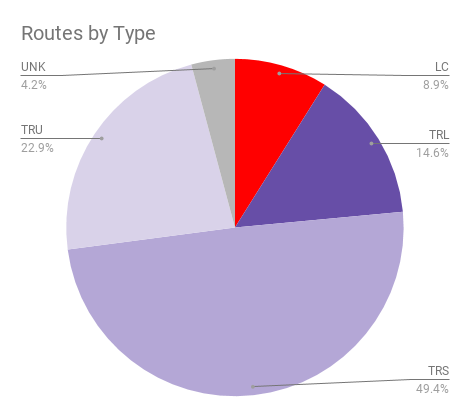 The more likely explanation is that I don't sample evenly from the routes at my gym, and some of the harder routes set will tend to be lead routes. If I don't climb it, it's not in this data set, so we can't generalize too much to the overall population of routes. 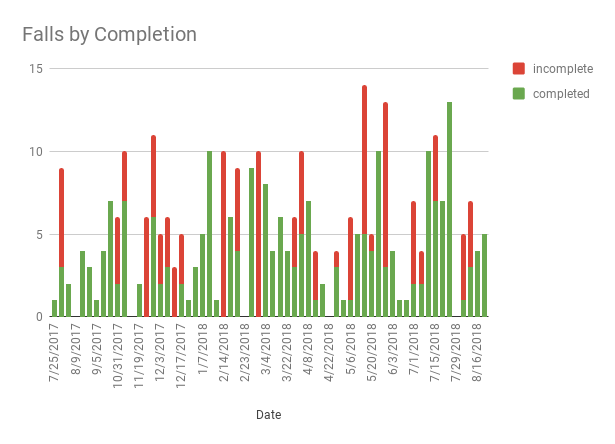 Tracking this data is very easy for me, thanks to a Workflow I built to streamline the process. Analyzing it, on the other hand, is a bit of a pain. I've been meaning to put together some automated analyses to help guide me in achieving my fitness goals, with climbing data being one of the inputs, but even without that being able to look at a year's worth of data is quite satisfying. It's clear that I need to focus on my lead climbing more if I want to start edging that distribution up.